So why is this? Well, as often is the case, the answer is quite simple. While it’s easy to assume that there’s only one form of fluoride, it can be found in many different forms. Added to this, where it occurs NATURALLY in rocks, it’s also found with many other trace minerals needed for healthy teeth and bones. As ground water percolates through rocks, not only does it pick up the fluoride, but these trace minerals as well. All of these substances – not just the fluoride – are then absorbed by the body as this water is drunk, resulting in healthy – and strong – teeth and bones. By contrast the fluoride ARTIFICIALLY added to drinking water is in a completely different form, without the necessary trace elements. The two most commonly forms are hydrofluorosilicic acid and sodium fluorosilicate. And, even worse, they don’t come from natural sources. Instead they’re the industrial by products of the phosphate fertiliser and aluminium smelting industries, which classify them as toxic waste. As a result, they have a completely different effect on the body when ingested. Instead of strengthening the teeth, tooth enamel is weakened; leading to dental fluorosis and an increased risk of decay. There may also be a brown discoloration of the teeth. Not only are the teeth affected, but also the bones, with an increased risk of thinning and fractures. Given this, it’s not difficult to see how fluoridation of the water has been linked to rising rates of osteoporosis and other bone problems. Unfortunately this is only the tip of the iceberg, with ARTIFICIAL fluoridation of water also being linked to a range of other health problems. These include hormonal problems, particularly thyroid and pituitary, as well as cognitive development and certain cancers. If we now cast our net more widely to look at other sources of ARTIFICIAL fluoride, the scale of the problem becomes clear. As does the amount a person may unwittingly consume in their lifetime. While the kidneys can remove some of it the rest remains in the body, stored in the bones, teeth and tissues. 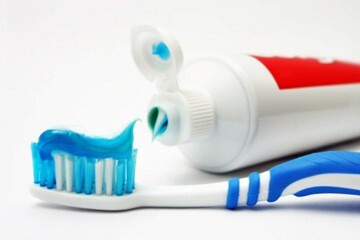 Toothpastes have already been mentioned and are probably the major source of fluoride for most people. This is regardless of whether you follow conventional advice and refrain from swallowing it; as it can be absorbed directly from the mouth while brushing your teeth. In addition many modern medications are fluoride based including antibiotics, antidepressants, antihistamines and antacids. Finally we must mention another major source of fluoride – along with many other industrial by products – and that is from airborne pollution. While air quality standards may have increased in recent years, air borne pollution remains a significant factor in many health problems. And not just Asthma, Bronchitis and other respiratory diseases. Well, going back to our blog post on tap water, regardless of what you’re told about your tap water, make sure you filter it before drinking. Don’t rely on the false sense of security that fluoride toothpastes offer. Follow the good old fashioned advice about looking after your teeth. Keep sugar – and sugary drinks – as well as refined foods generally to a minimum. Make sure your teeth are brushed twice a day with a good quality fluoride free toothpaste – and there are many different makes and flavours available these days. Use a salt water mouth wash if there are any signs of gum diseases, decay or discoloration. And, when you go to the dentist, avoid any fluoride treatments given to strengthen the teeth. These have been found to cause huge increases in fluoride levels in the blood for many hours afterwards. And, particularly for children, risks of stomach pain, nausea and vomiting and short-term kidney damage.